Yesterday we explored the Old City, and I must say it didn't come easily. I'm not sure if jetlag had finally caught up with me, or if I just woke up on the wrong side of the bed, but mentally exhausted was exactly how I felt. Still, I'm in China and lying around just wasn't an option. We decided to meet at the People's Square and head off on a little walk to the Old City. It was incredible to see the city change before us. People's Square is central Shanghai and has lots of sky-scrapers, McDonald's, shopping malls, the works. Once you start walking South, the city changes and becomes much grungier, crazier and looks more like a developing world country. Then you get to old town after about 15 minutes and you're in the epicenter of what you think China looks like from a stereotypical perspective. Ornate buildings that look very traditional are everywhere with tourists snapping photographs and stores selling everything from Chinese candy to jewelry. I felt very touristy being there, but I have to admit it looked really cool. 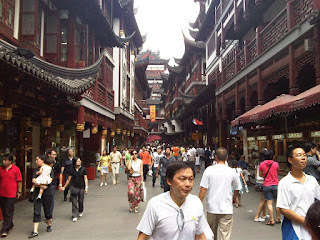 Walking around, having people run up to us trying to sell us things, seeing all the traditional looking buildings - it really felt like we were in the middle of a Chinese city. Once you get through the area you are again on more developing world-looking streets with shops that sell tons of clothes, shoes and electronics. Moderately priced, you can't help but notice that the Nike swoosh isn't quite how it's supposed to look. At this point we realized a drink would be nice to get away from the heat and humidity, so we walked North along the river. This street was under construction and had that grimy, industrial look with little huts where men and women sold sodas and foods. The amazing part of it was that you just look across the river and you see Pudong and the ultra-modern and elegant skyscrapers there. The contrast is incredible. We also had the luxury of walking through a quiet park of bamboo and ponds. It was quaint and pretty. The highlight was when a teenage girl ran up to me and in very good English asked, "Excuse me, but can I take my picture with you?" I laughed and said yes, of course and her and a few friends gathered around me while somebody else took our picture. I definitely can't say that's ever happened before. So we ended up sucking down some Starbucks which woke me up and grabbed a drink at a bar downtown. We then navigated the streets to an Indian restaurant that was recommended in a lot of Expat magazines. I'll have to get the name of it (I forget right now), but it was by far the most amazing Indian food I have ever experienced. Just thinking about it now makes me very hungry.